St. Valentine's Day in St. Hilary's! The vicar has been asked by the bishop to hold a special service in St. Hilary's to celebrate love and marriage on the Sunday after Valentine's Day this year. The vicar has already sent invitations out to all of the couples who have been married in St. Hilary's over the last few years and also those couples who plan to be married in St. Hilary's too. He HAS enjoyed planning this service........but it has also brought back memories of his dear late wife and so he has been feeling a little bit sad too because she won't be able to be with him for this special service. However he doesn't want to let it upset him too much. Esther is the very first to arrive on Valentine's Day. 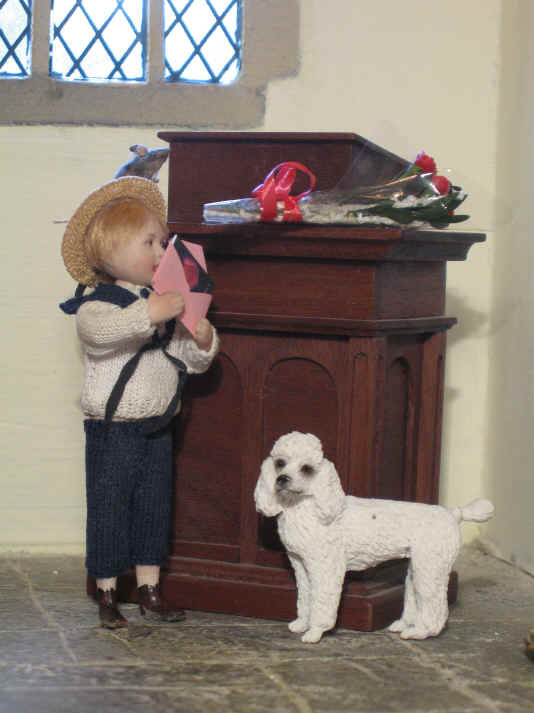 Ambrose has been SO good and carried the heavy bucket of red and white roses she will use to make an altar flower arrangement for the very special service to celebrate love and marriage. Can you see Ambrose is carrying a Valentine's Day card..........for his girlfriend, Alice. Ah.......here is Robert Alexander and Ben. What a beautiful bouquet of roses Robert Alexander has brought with him. Tom has brought a Valentine's Day card...........wonder WHO he wants to give it to today? 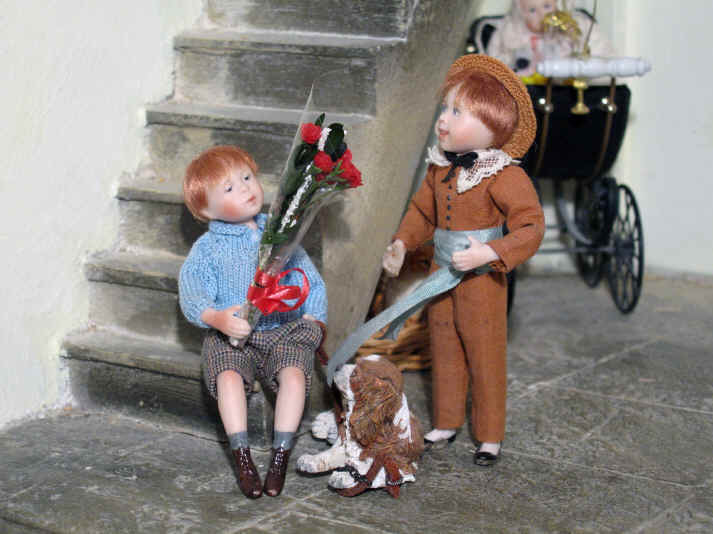 Robert Alexander has already put the bouquet of roses on the pulpit....and Tom ........are YOU giving the vicar a Valentine's Day card? Belle is really jealous............SHE would like a bouquet of roses too but she doesn't think anyone special loves her enough to give her one THIS year.......poor Belle! 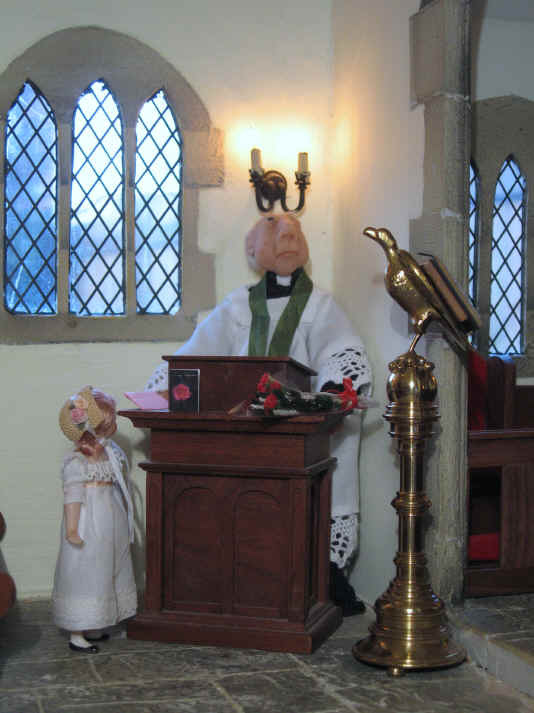 Can you see another little friend who is perched on the pulpit.....it is....of course, Sepp! Tinker has always thought that Magnifi-Cat is TOP cat so she has brought HIM a Valentine's Day card.....especially chosen because it has......guess what........CATS on of course! Magnifi-Cat, being the cool cat he is, takes this hero worship from Tinker in his stride................he KNOWS she will never be as good at catching rats and mice that plague the churchyard as well as him! 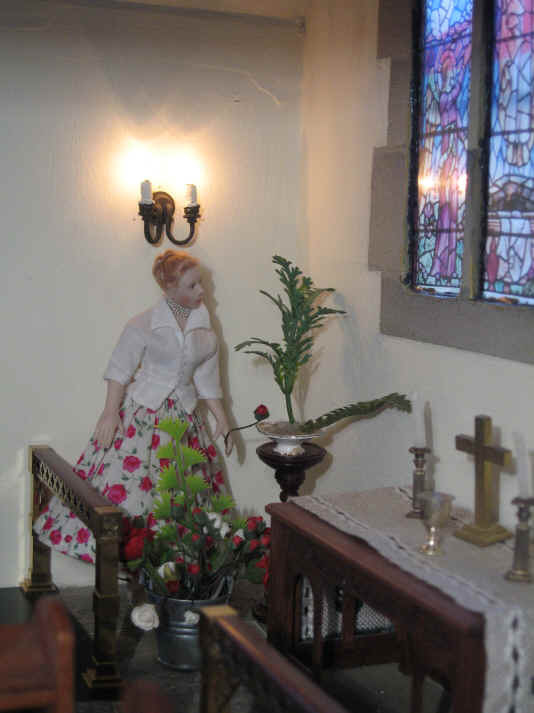 Oh dear....... Esther looks a little bit sad as she arranged the flowers in the sanctuary. She has only just had a phone call from Stephen, her husband. He has been working overseas and was due to fly home today. However he now has to stay a few days longer. Esther is upset because she was looking forward to him being with her at this special love and marriage service to be held tomorrow. 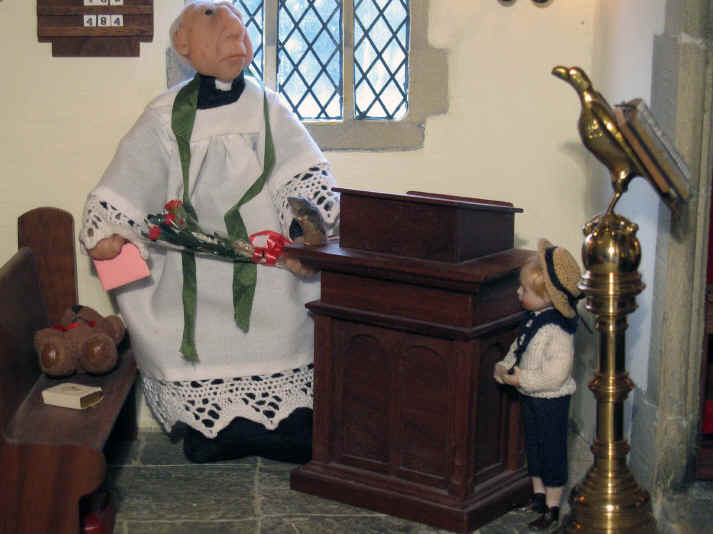 The vicar has now arrived................and he has found the bouquet and card on the pulpit left for him by the boys. Can you see a little person hiding? It is Tom....he was so excited as he wanted to see the vicar's reaction to their special "cheer up" surprise! 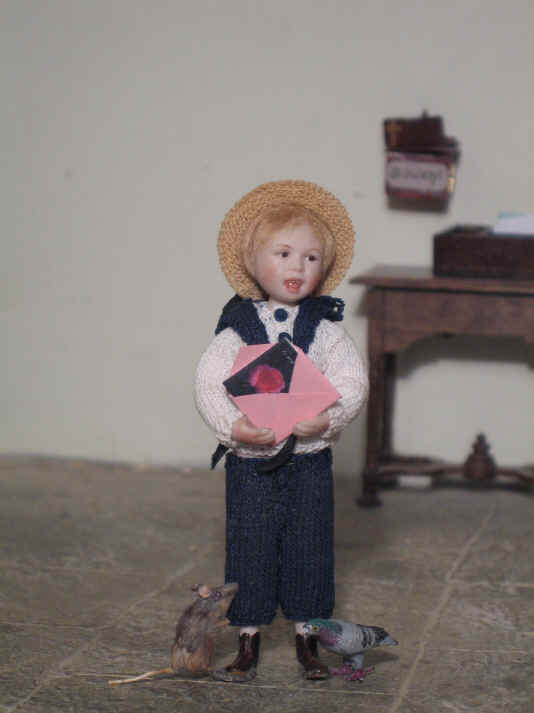 Tom tells the vicar that he knows how much he misses his dear wife but he must remember that ALL the children and congregation love him very much and wanted him to know that! 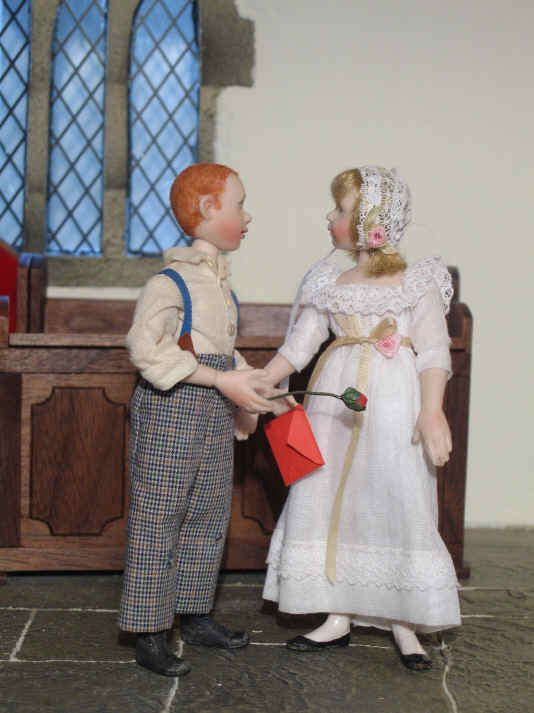 Love is certainly in the air.............Ambrose has finally plucked up courage and is giving Alice his card and a rose bud. 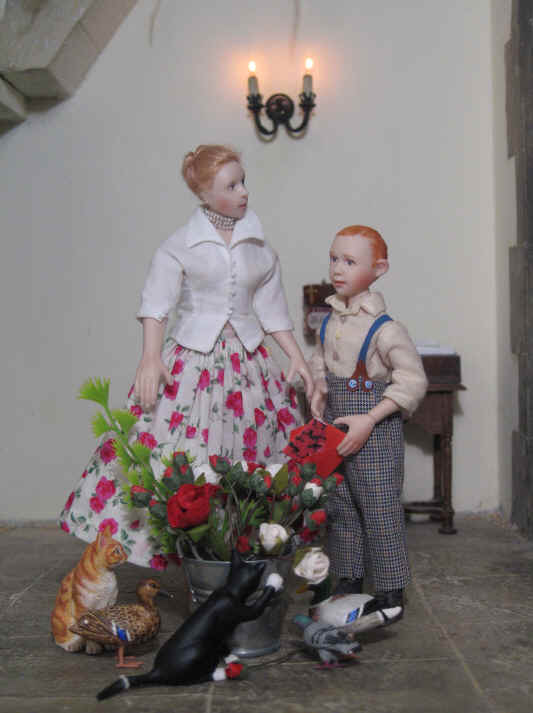 They both dream of marrying in St, Hilary's when they are older and are also looking forward to the special service celebrating love and marriage tomorrow. The children are all sitting down and having a little rest so the vicar is talking to them about Valentine's Day and the meaning of love. He tells them that he is thrilled that they gave him the bouquet of roses and card and that it has really cheered him up! The vicar explains that our loved ones cannot always be with us. Esther, their Sunday School teacher, is a little sad because Stephen is away from home on business and he, the vicar, is missing his dear late wife as she is no longer with him. However he tells the children that they must NEVER forget that there is a greater love than our love for each other and that is the love of God. God NEVER leaves or forsakes us even if our loved ones cannot always be with us. Look what Adele has brought..........a home made Valentine's Day cake made out of her very favourite sweets...........dolly mixtures! 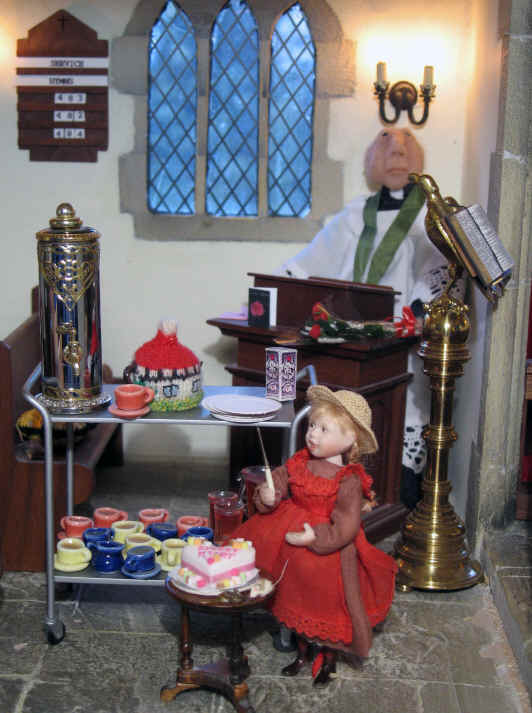 She has brought some paper plates as well so that they can ALL enjoy a nice cup of tea,coffee or juice with a piece of cake after all of their hard work preparing the church for the special Love and Marriage service tomorrow! 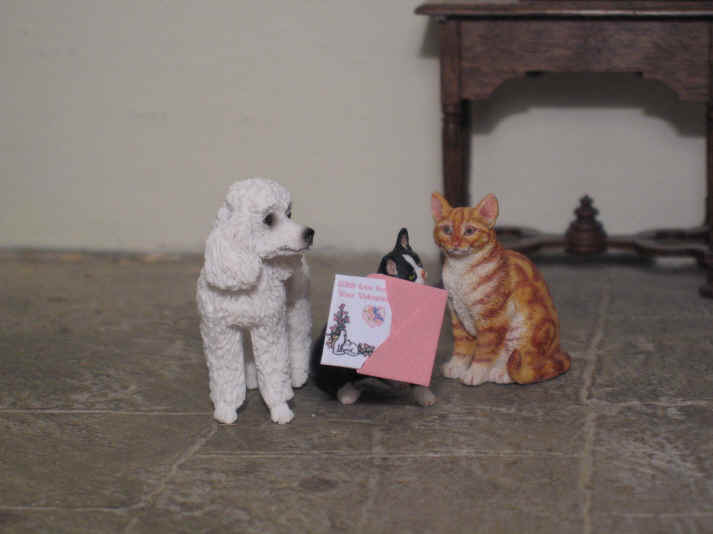 Thanks to Frances of Buttercup Miniatures for the Valentine's Day cards! Thanks to Catherine of Dollshouse Heaven for the bouquet of roses.